400 recent area conference held in Newton were given by Carol Sammons, Nellie Lincoln and Rachel Mikkel. 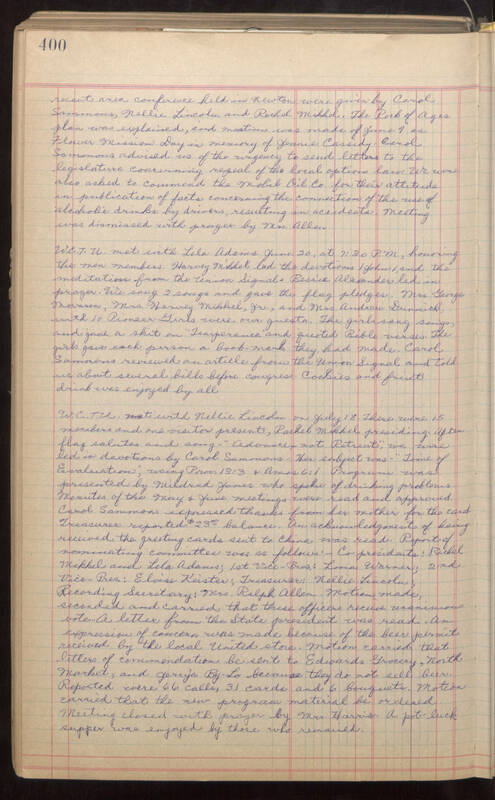 The Rock of Ages plan was explained, and motion was made of June 9 as Flower Mission Day in memory of Jennie Cassidy. Carol Sammons advised us of the [wegency?] to send letters to the legislative concerning repeal of the local options law. We were also asked to commend the Mobil Oil Co. for their attitude in publication of facts concerning the connections of the use of alcoholic drinks by drivers, resulting in accidents. Meeting was dismissed with prayer by Mrs. Allen. W.C.T.U. met with Lela Adams June 20, and 7:30 P.M, honoring the men members Harvey Mikkel led the devotions 1 John 1, and the meditation from the Union Signal. Bessie Alexander led in prayer. We sang 2 songs and gave the flag pledges. Mrs. George Mornson, Mrs. Harvey Mikkel, Jr., and Mrs. Andrew Dunnick, with 10 Pioneer Girls were our guests. The girls sang songs, and gave a skit on "Temperance" and quoted Bible verses. The girls gave each person a book-mark they had made. Carol Sammons reviewed an article from the Union Signal and told us about several bills before congress. Cookies and fruit drink was enjoyed by all W.C.T.U. met with Nellie Lincoln on July 18. There were 15 members and one visitor present, Rachel Mikkel presiding. After flag salutes and song - "Advance - not Retreat," we were led in devotions by Carol Sammons. Her subject was 0 "Time of Evaluation," using Prov. 13:3 & Amos 6:1. Program was presented by Mildred Jones who spoke of drinking problems. Minutes of the May & June meetings were read and approved. Carol Sammons expressed thanks from her mother for the card. Treasurer reported $23.00 balance. An acknowledgement of having received the greeting cards sent to China was read. Reports of nominating committee was as follows' - Co-presidents: Rachel Mikkel and Lela Adams; 1st Vice-Pres: Lona Warner; 2nd Vice-Pres. : Eloise Keister; Treasurer: Nellie Lincoln; Recording Secretary: Mrs. Ralph Allen. Motion made, seconded and carried that these officers receive unanimous vote. A letter from the State president was read. An expression of concern was made because of the beer permit received by the local United store. Motion carried that letters of commendation be sent to Edwards Grocery, North Market, and Gerry's By-Lo because they do not sell beer. Reported were 66 calls, 31 cards and 6 bouquets. Motion carried that the new program material be ordered. Meeting closed with prayer by Mrs. Harris. A pot-luck supper was enjoyed by those who remained.